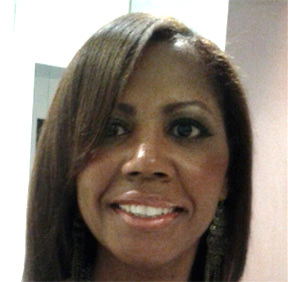 On September 6, 2010, Sharron Mangum, a black woman and college graduate, thought she had won the jackpot at age 44. 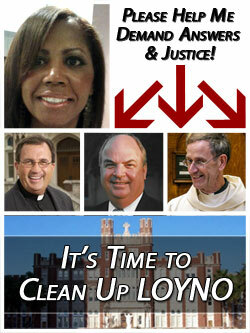 After seven months as a temporary worker handling the responsibilities of the Executive Director of Administrative Operations (EDAO) in the College of Social Sciences (CSS) at Loyola University New Orleans (LOYNO), she was appointed full-time, handling those same responsibilities, testimony to the quality of her work. Ms. Mangum, a person of strong Christian faith, now happily envisioned a career working in a highly respected faith-based campus community. Sharron D. Mangum hails from Star, Mississippi. She studied the Social Sciences at National-Louis University and Law at John Marshall Law School in Atlanta, Georgia. She holds a Bachelors Degree in Applied Behavioral Science. Sharron has twenty years of experience in Human Resources of which seventeen years were spent in Atlanta. The majority of her career was at a Fortune 500 company and secondary and higher education institutions — providing support in HR administration, leadership and training design, development and facilitation. Since relocating to New Orleans in 2007, Sharron has worked with small businesses and offender reentry organizations. Through her volunteer work with the Orleans Public Defenders and local offender reentry programs, she has helped offenders to expunge their felony records, develop résumés and learn soft/technical skills to qualify for employment. Sharron has been an invited speaker at professional conferences around the country. She has served as a consultant and adviser to a long list of organizations on topics ranging from Instructional Design Best Practices, Reentry and Restorative Justice, The Development and Employment of Former Incarcerated Persons, HR Best Practices, Labor and Employment Law, and much more. Sharron currently holds the position of Executive Assistant to the Dean in the College of Social Sciences. 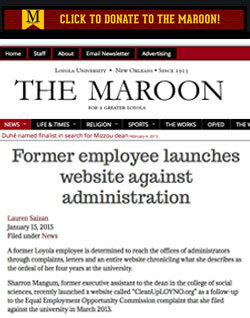 On June 9, 2014, Ms. Mangum notified LOYNO"S President Fr. Kevin Wildes of her "constructive termination." Constructive termination is defined as when an employee quits or resigns from their job because working conditions become so intolerable the employee feels they have no choice but to leave. Ms. Mangum has a pending complaint with the Equal Employment Opportunity Commission (EEOC) against LOYNO for race and age discrimination and constructive termination. Ms. Mangum is being represented by Corporate Campaign, Inc. which has produced this website.